Following the pleasing success I enjoyed during the second week of January here including the capture of a 60cm bass, I was delighted when the weather patterns returned to that rather benign state, just in time for the next set of ‘high tides’ arrived to peak within darkness. I’d enjoyed one other session on the 14th January and had managed to winkle out a small (1½lb) bass once again on the senko, but it wasn’t until the 20th when I conducted my next session. A couple of days previously we’d experienced a bit of wind and rain for what had seemed like a good few weeks. Therefore, it was with a little trepidation that peered over the bank to take a look at the clarity of the water as late evening approached. I was in luck though, as it was still gin-clear… Now I started to become excited! With high tide expected at around 1740 and official darkness commencing at 1724 my thinking was that the two combining would be enough to turn any bass present into a feeding frenzy. I made a few speculative casts with the ‘Smoke’ coloured Wave Worm Tiki Bamboo Stick here before attaching the proven white version and settling down with a cup of tea and biscuit as I waited for it to become properly dark – no point in disturbing the area where my thoughts… It was a bit nippy though! 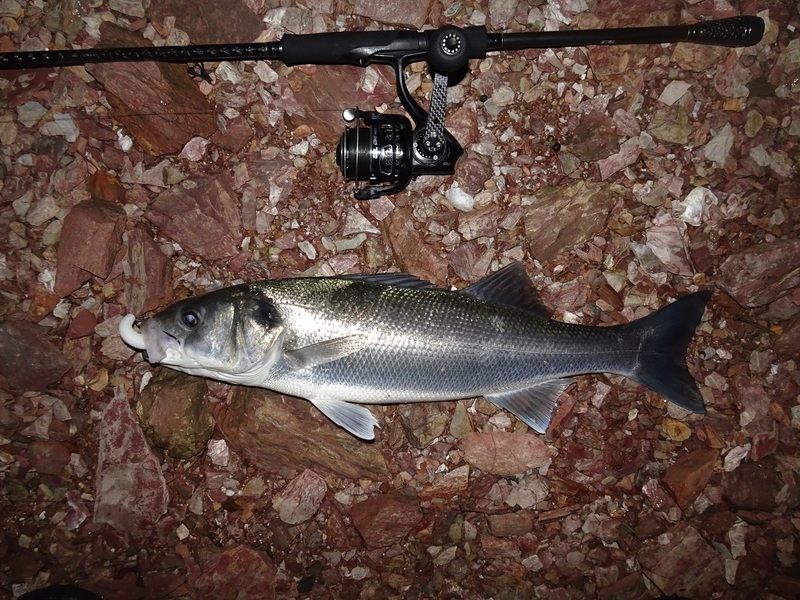 At around 1730 I made my first cast and retrieve of the night, just as I sensed that the tide had run out of steam. About ten minutes in and therefore right on top of the tide at 1740 I made a cast slightly to my left into a region of ‘bumps’ or undulations in the seabed. A few turns in and BANG! My new lure rod (the Tailwalk EGinn 88M Max 35g here) was thumping away as a bass took a metre or so of line, before gliding towards me, splashing on the surface and then heading straight towards me! This is when owning a reel with a gear ratio of 6.2:1 really helps as I quickly regained contact just as my bass was about to reach a large patch of wrack to my left. Again, it took some line but when it surfaced I knew it was beaten – the rod had done a great job of tiring this one out! My new stealthy looking set up! The balance of this rod is unbelievably good which makes hooking and landing bass like this 55cm stunner a hugely enjoyable experience – even more so in the middle of winter. As I guided her through a gap in the weed I was really pleased to see the 5/0 Owner Weedless hook well and truly buried in the corner of its mouth. She wouldn’t be escaping therefore, I enjoyed the moment as I allowed what looked like a bass close to 4lb to effectively beach herself before swooping down to gently lift her up the shingle. Cold but extremely happy to have ‘christened’ my new lure rod – one that I intend to write a review about in due course. What a pretty winter bass she is! I’ve been having a bit of a nightmare with the battery pack on my Action Camera (the Akaso EK7000 here) recently I eventually remembered that I actually had a spare battery for it! I duly charged it up and I haven’t experienced any further issues thankfully. I am so glad as the video of this beautiful bass swimming away (below) came out well and I think it is one of my favourites. Now I am in the early stages of attempting to ‘work out’ this particular mark, but it does seem that the bass (travelling in a real variety of sizes and year groups) move through in within a very brief window that can only last for 10-20 minutes. Confirmation of this theory was further enhanced when about five minutes after returning my 55cm bass the rod slammed over again, but this time much closer to my stance. Three nights later on the 23rd I was at it again, much to the dismay of my very understanding wife who took great pleasure in telling me how ‘mad’ I was to still be going out night fishing at the end of January! But with conditions set to be absolutely ‘spot on’ I was feeling exceptionally confident that I would catch one and return home with yet another photo to show her just as she is about to go to sleep! She puts up with a lot bless her! High tide was due at 1959 and for the first hour it did remain quiet. But safe in the knowledge that high water can signal their appearance I wasn’t too shocked when I felt a tap, tap and then the rod went solid as a bass seemingly ‘mouthed’ the white senko before deciding to engulf it, whereby it felt my resistance and splashed wildly on the surface only 10m out in the gloom. I knew it wasn’t massive, but I was pleasantly surprised when I did catch a glimpse through the wonderfully clear water that nearly always seems to be present here (a huge bonus, of course). Bass are remarkable creatures. This one grabbed the lure bang on high water at precisely 1959! At 52cm the bass has, in all probability, reached maturity and will presumably be heading south and west to find warmer water in which to commence the breeding and subsequent spawning process – or will he/she? I think bass are more attractive in darkness than in daylight! Yes, I am bonkers and slowly turning nocturnal again… I have fished this stretch during the day recently but I haven’t had a sniff so there’s definitely something about the dark that is switching them on here. Something that struck me about this bass was the relatively small size of its tail and the larger than normal size of its dorsal fin – it looked more like a perch! It all makes me wonder whether this crop of bass, that I have found in January, are in fact inter-breeding and potentially remaining in situ throughout the entire winter? The only way to really find out, of course, is to a) catch them and b) tag them. How I didn’t land one that night I’ll never know! I had a good hit after three casts really close to me, but the second one really had me thinking this could be the night! 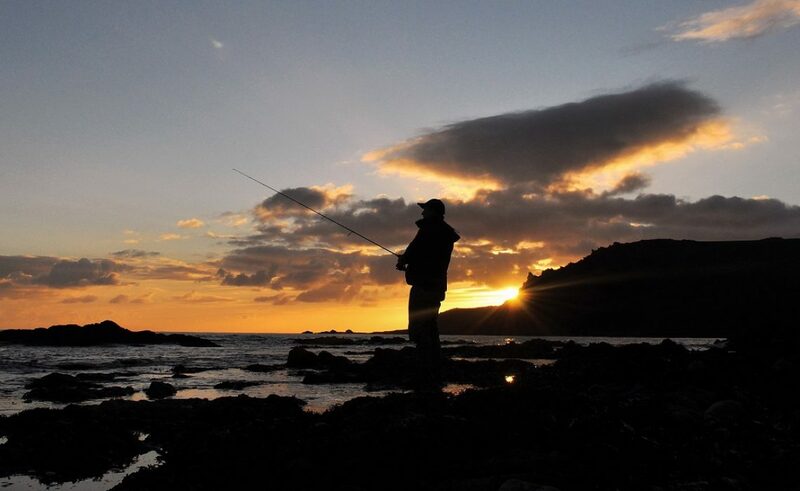 I’d made a powerful cast out to the edge the current, but rather than allowing the lure to flutter to the seabed I clicked the bail-arm over and began to retrieve straight away… Three turns in and the rod just slammed over! The bass stopped momentarily and then the reel started singing as the bass dragged line off the spool with consummate ease at a range of 35-40m – this was what I’d been waiting for! But no sooner had the bass began to really power into the tide the line went slack – the hook-hold had failed. A rare event indeed when lure fishing with a 5″ soft plastic, but I knuckled hoping (praying almost) that I’d get another chance. Ten minutes later BANG, but no hook up! Rather frustratingly, about 30 minutes later I received another tentative pluck on the lure, then another. But unlike many occasions before it, this time the bass that was following the lure decided it wasn’t quite tasty or realistic enough to fully commit. Incidentally, I have written a short blog post for the Lure Fishing For Bass website here in relation to some of my theories and what bass may indeed ‘think’ these very innocuous lures actually are. February is historically the most difficult month in the year to land a bass on a lure. However, if the conditions are right then I will definitely be giving it a go! At the very least it keeps me sharp and ready for when the season does commence. If you are interested in purchasing my book (that was released on the 8th October) titled ‘The Lure of The Bass’ please see my recent blog post here for details on how to purchase a copy. I have commissioned a second batch of books therefore I have plenty in stock.